Congressional Democrats gathered outside the Supreme Court Tuesday to denounce President Trump's nomination of Judge Brett Kavanaugh to the Supreme Court. "Last night, President Trump took a step that millions of Americans feared he would take and nominated to the Supreme Court someone who would fulfill campaign promise to overturn Roe and declare healthcare for Americans unconstitutional," Senate Minority Leader Chuck Schumer said. 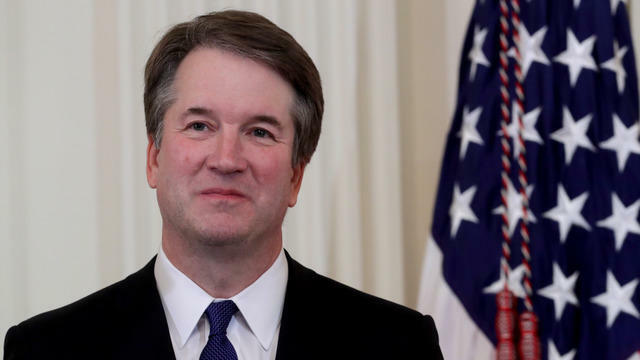 Mr. Trump announced Kavanaugh as his pick Monday night, his second nomination to the nation's highest court. He expressed concern about how Kavanaugh could vote on health care protections and abortion rights, and he described the nominee's judicial ideology, saying he is "not moderate, is not mainstream." "For every American who cares about women's health, about protections for people with preexisting conditions, about civil rights, labor rights, LGBTQ rights, environmental rights: Now is the time to fight. Now," Schumer said. Schumer also referred to Kavanaugh's nomination and likely confirmation as a big win for his Republican counterpart, Senate Majority Leader Mitch McConnell. Under President Obama, McConnell and other Senate Republicans blocked the confirmation of Judge Merrick Garland, arguing that Mr. Obama should not nominate a Supreme Court justice in a presidential election year. This kept the seat open for Mr. Trump, who put conservative Neil Gorsuch on the court. "Mitch McConnell has had as his goal to create a hard right Supreme Court and nothing has stopped," Schumer said. "And if he weren't around, we wouldn't be in this position." Sen. Dianne Feinstein, D-Calfiornia, said that Kavanaugh's history in politics-- both in court and as a Bush administration alumni-- would make him "among the most conservative justices in Supreme Court history," once confirmed. At the podium, Sen. Richard Blumenthal, D-Connecticut, announced his intent to vote "no" on Kavanaugh's confirmation and encouraged his colleagues to do the same, unless he "commits to recuse himself" on any issues relating to Mr. Trump that may come up in Special Counsel Robert Mueller's Russia investigation. Sen. Patrick Leahy, D-Vermont, described Mr. Trump's nomination as a move to make the Supreme Court another "arm of the White House."